Krunkles returns in Vol. 20 of our Side Project series… The Doctor is in with a new white farmhouse IPA! Krunkles reaches new heights in complexity and flavor by combining the malt and spices of a Belgian Witbier, the yeast of a Farmhouse Ale, and the hoppy goodness of an American IPA. 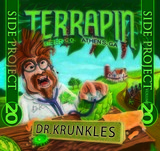 Dr. Krunkles’ twisted touch is a dash of white peppercorn and wood aging on white ash.